Earth Day occurs during Poetry Month, so as you’re planning your activities to celebrate the Earth, why not include some poetry? Here is a list of a few excellent nature-inspired poetry picture books, as well as suggested Earth Day activities to accompany the reading of each book. Enjoy! A dramatic collection of haiku with extensive backmatter about the rocks and waters that make up most of the earth, and the forces that shape them. Earth Day Activity: Go on a rock hunt! After reading Earth Verse, go on a walk and look for interesting rocks in your neighborhood. See if you can identify your favorite rocks using a rock identification guide. Are the rocks igneous, sedimentary, or metamorphic? How do you think the rocks got there? Let your imagination run wild. Imaginative free verse poetry from multiple points of view about the fascinating finds that are common in the woods throughout the year. Earth Day Activity: Go on a poetry scavenger hunt! Find a forest near you and go for a visit. Before you leave, put small Post-Its on each page of Forest Has a Song identifying the subject of the poem on the page (to help you find poems quickly on your walk). The first time you see something written about in the book, stop and read the poem about it. When you read the poem, remove the Post-It and put it in a safe place. At the end of your walk, count your Post-Its. How many poems did you find? Earth Day Activity: Put on a show! Every poem in Hidden City focuses on some sort of event, so you can act them out. Pick your favorite poem or poems. Then, using cardboard and paper from your home’s recycling bin, make props, costumes, and stick puppets (paper cut into the shape you want and taped to a stick). Invite your family and friends to an outdoor picnic so they can enjoy the show and some sunshine. 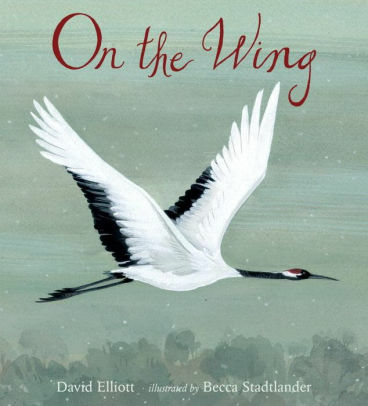 Lovely rhyming poems about birds, focusing on elements that are specific to each species. Earth Day Activity: Birdwatch for Beauty! Read On the Wing, and then go on a birdwatching walk. Bring your binoculars so you can get a good look at the birds, even if they’re far away. Talk about what you think is beautiful and unique about each bird you see and hear. Engaging poems in a variety of forms featuring different species and elements of trees. Earth Day Activity: Draw a Tree! 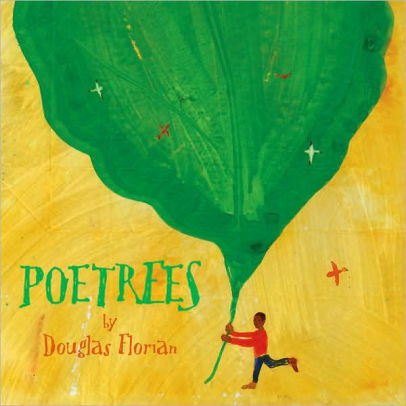 Read Poetrees, and notice how Florian draws loose shapes to depict whole trees. Cut some old paper shopping bags so that you have large, flat pieces of brown paper. Pick a tree near your home, go outside, and draw it. Use crayons or pastels on the brown paper and Florian’s art style as inspiration. A picture-book length anthology of poems highlighting the questions and wonder that inspire different fields of science. Earth Day Activity: Go ahead and ask! Walk slowly around your backyard, local park, or another local nature area. When something catches your eye, spend time observing it. Get as close as possible and try to look at it from different angles and distances. Come up with a question about what you found and write it down. On your walk, try to come up with ten questions. When you are done with your walk, pick the question that is most interesting to you. Now, go in search of the answer! Your local library can help. 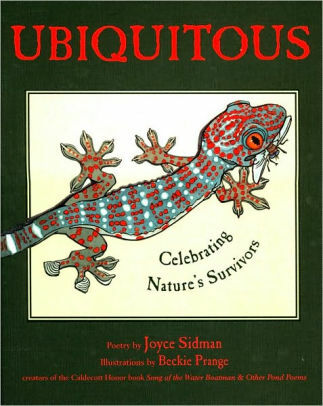 Jubilant poems in a variety of forms with fascinating sidebars about lifeforms that are thriving in today’s world. Earth Day Activity: Throw a Party! Surviving evolution and climate change is a major accomplishment—so why not celebrate the animals and plants that have succeeded? Throw an eco-friendly party with different activities and crafts featuring the subjects of poems in the book. Reuse old cardboard and paper to cut out animal shapes that you hide for a scavenger hunt, practice coyote howling, and paint pots that you plant with native grass species. It’s a party—have fun! 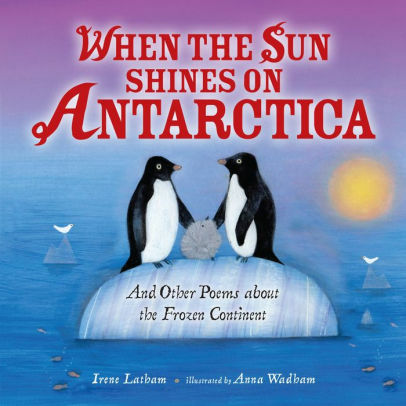 Descriptive, lilting poems immerse readers in the world of wildlife living on Antarctica, accompanied by informative sidebars and backmatter. Earth Day Activity: Map It! Celebrate this distant area of the Earth, whose changing ice impacts all of our oceans, by drawing it. Create a map of Antarctica, and research where on the continent the animals in When the Sun Shines on Antarctica live. Add them to the map in the correct locations. Don’t forget to label the oceans! Sarah Grace Tuttle is the author of Hidden City: Poems of Urban Wildlife. She has degrees in English, Environmental Studies, and Writing for Children. Sarah currently lives in Arlington, MA, and helps to facilitate a local conservation group. You can visit her online at www.sarahgracetuttle.com.